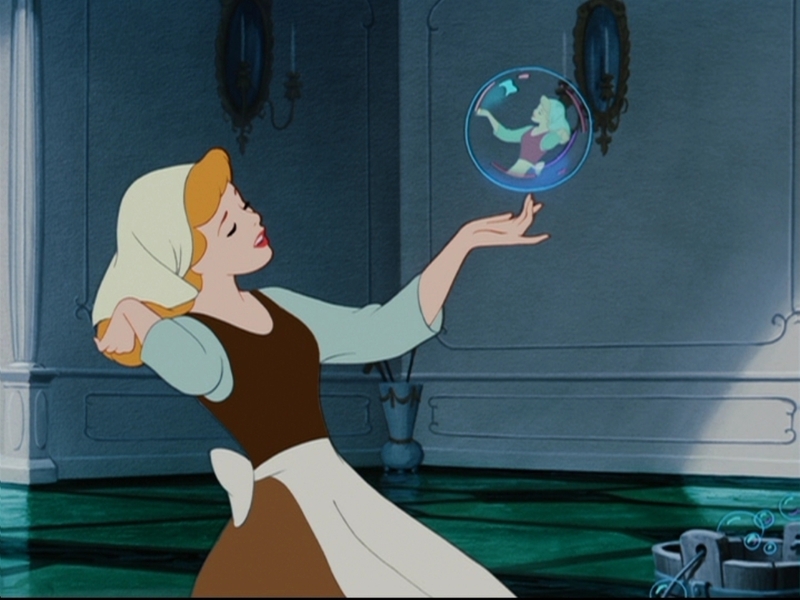 The conversation made me think, though, about the need for ‘feminist-ifying’ Disney heroines. When I was a kid, watching all those classics like ‘Aladdin’ and ‘Cinderella’ and ‘Pocahontas’ for the first time, I never really thought about what kind of social codes or behaviours they were prescribing. Now, with all the revamping, they’re coming under some heavy fire and re-examination, so of course I jumped on the bandwagon and went back and rewatched an old favourite: ‘Aladdin’. 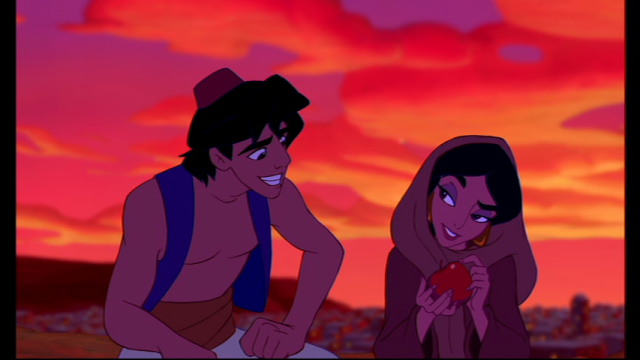 Aladdin was my first crush, and continues to be my favourite Disney prince of all time. Someone once told me that I looked like Jasmine. Anyway, the rewatch (which took place in September 2014, to be precise, in chilly Chicago, in the company of one of my best friends) made me realize something: Disney already had a fiery, feminist princess, way before Mulan entered the scene. And that princess was Jasmine. 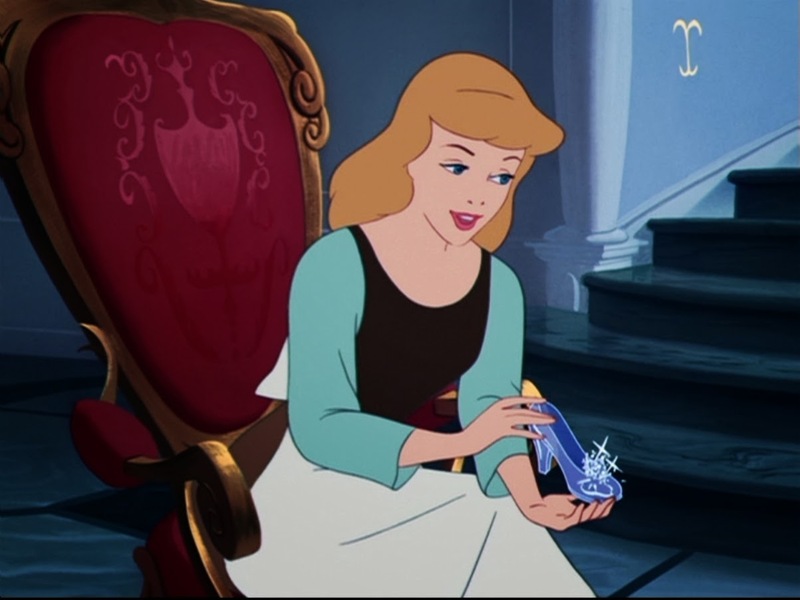 What’s in a name: ‘Beauty and the Beast’, ‘Cinderella’, ‘Little Mermaid’—what do all these classic Disney princess movies have in common? They all include/refer to the female protagonist (the ‘princess’) in their title. 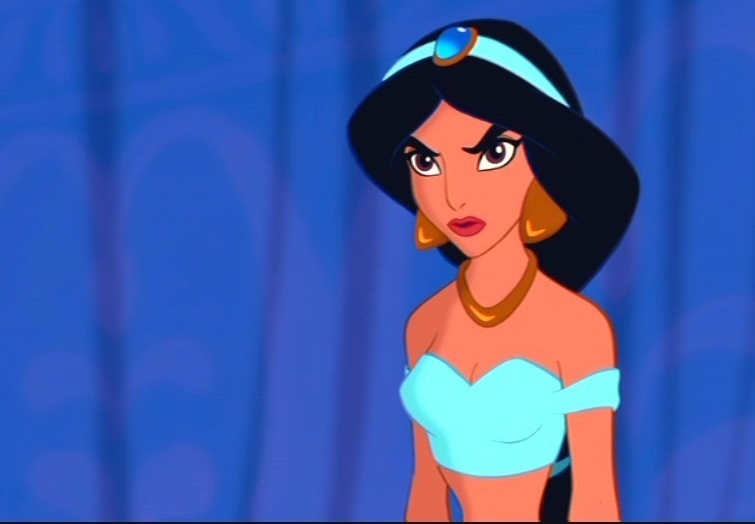 Aladdin’s Jasmine is the only one of the original line up to not enjoy that privilege. She is also, notably, the only female character in her movie. Apart from the denizens of a brothel who show up once (during the song ‘One Jump’), and a little girl at the fruit market, Jasmine seems to be the only woman in Agrabah. Or the only woman who’s important enough to be part of the titular hero’s story anyway. She has no female support system, and her only friend is a tiger trained to dismiss troublesome suitors. Sticking it to the marriage market: When we meet Jasmine, she has just cast off the unwanted advances of yet another conceited princeling. It’s not the first time this has happened—her father has been foisting suitors onto her for a while because the law says she ‘must be married’ to ascend the throne. ‘The law is wrong,’ she says, and all her actions seem to suit her words. Even when ‘Prince Ali’ shows up, impressing the Sultan with his grand entrance, Jasmine remains unmoved. ‘I am not some prize to be won!’ is her melodramatic exiting line. You go girl. The existential angst: There’s no question that Jasmine feels ‘trapped’. The movie is full of symbols of her seeking the freedom she lacks—freeing the birds in her garden, jumping over the walls to see what awaits her on the other side, even, at one point, declaring that maybe she doesn’t ‘want to be a princess anymore!’. I suppose you could pin this down to poor-little-rich-girl angst, especially when you contrast it to Aladdin’s desire to find a place/security in his street rat world. Also, when she breaks out of the palace, Jasmine very obviously has no idea how to function in the ‘real world’, nearly losing her hand for her naivety. But she’s a fast learner, and picks up quickly enough. Smooth playa: Jasmine remains unimpressed by ‘Ali’s’ grandiose display. Jasmine is also a keen observer and can tell quickly that ‘Ali’ is not who he says he is, and is bold enough to confront him about it—‘Why did you lie to me?’, she demands after their romantic ride. 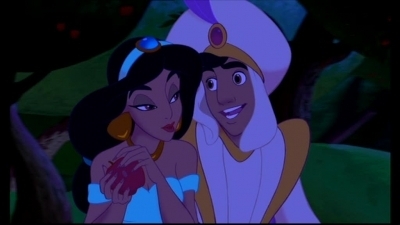 Also, look at this bit from ‘A Whole New World’, where Aladdin rolls an apple off his shoulder and Jasmine catches it: it’s obvious she’s figured out who he is. 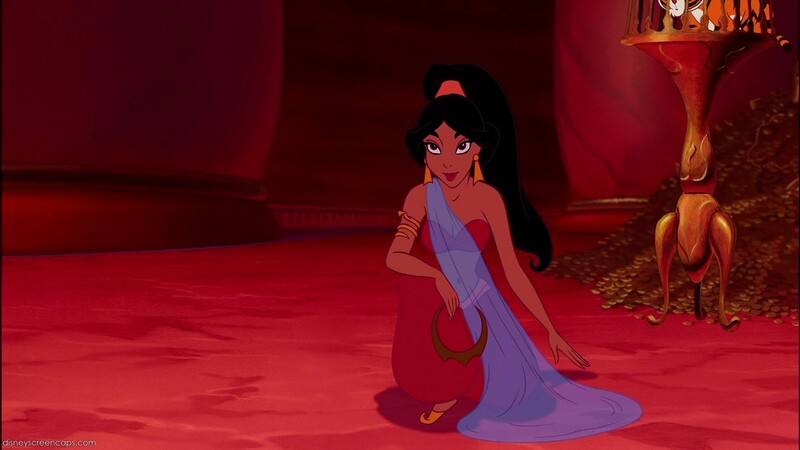 seduces Jafar, distracting him in order to let Aladdin get about his mission of ‘making things right’. Jasmine knows what she’s got and she ain’t ashamed to flaunt it. If you don’t think this is a big deal in a kids’ movie…well. I really don’t know what to say. 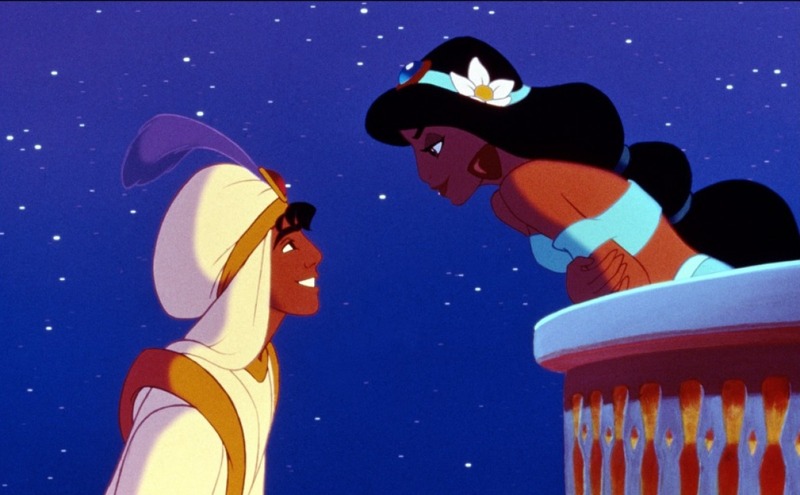 Of course, it could also be said that, as the only ‘exotic’, Eastern princess in her time, Jasmine was unfairly sexualized in a manner that her fellow ‘white’ princesses like Aurora and Snow White were not. But at least she owns her sexuality, and uses it to achieve her ends on her terms. 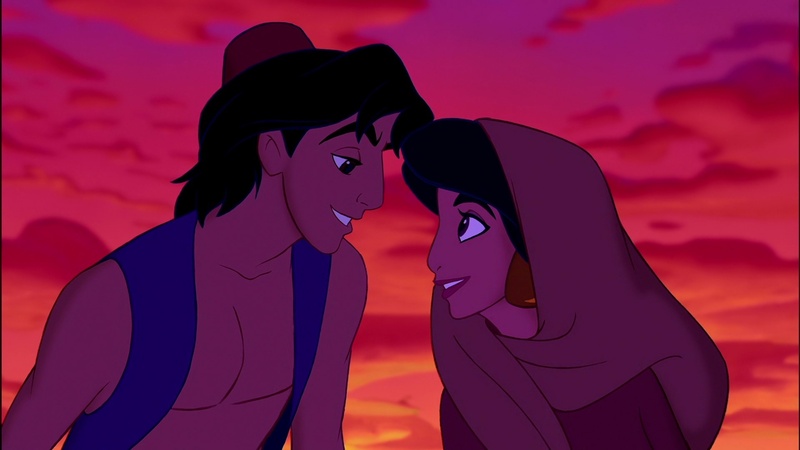 At the end of the movie, Aladdin is promoted to ‘suitable’ status because of his exploits, and Jasmine agrees to abide by age-old conventions and get married, so maybe this is a bit of a cop out. 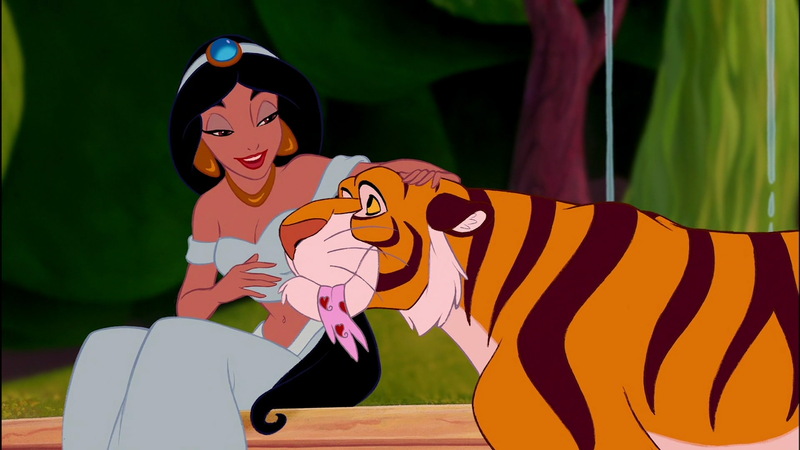 I’m looking forward to the rework that Disney will no doubt get down to making, where Jasmine is the real heroine (let’s face it, she’s a lot more fun than Aladdin) who makes her way in a man’s world, maybe picking up a street rat or two on the way. But only if she wants it, of course.